The Tiger Wall series consists of the lightest tents that Big Agnes makes with two doors, and the Tiger Wall UL2 MtnGlo Tent includes MtnGlo lighting for even more convenience without weighing backpackers down too much. MtnGlo technology is an LED lighting system sewn into the upper seams of the tent that is powered by three batteries (batteries not included). Once on, the lights create a nice mood lighting that's ideal for rigging gear, playing games, checking maps, or getting that perfect tent glow shot. 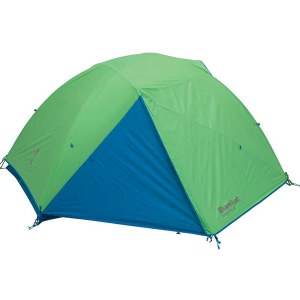 The tent features a silicone treated nylon fly and floor with fully sealed seams to keep wet weather out when you're hunkered down for the night, while steep walls increases space without adding bulk to maximize space within the tent, so you can stretch out and play a game by the MtnGlo lights while you wait out the storm. When you're ready to break camp, the flexible lighting system allows the tent to be easily packed away just like any other tent, and the DAC aluminum Featherlite poles keep the trail weight under three pounds for comfort when you're logging long miles on a daily basis.